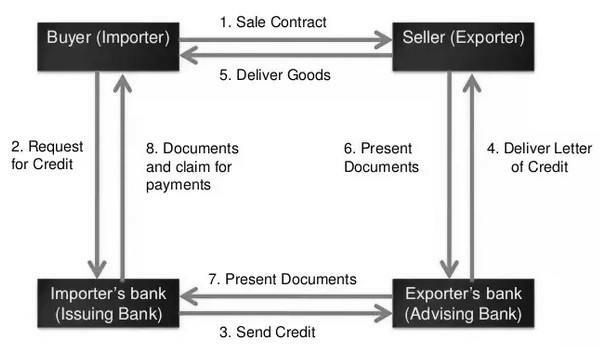 Let us see what a Letter of Credit means, who are the parties, involved in LC and how the LC process takes place in simple words using an example. Let us assume that there is an international trade contract between Mr. A from the U.S.A. being the importer and Mr. X being the exporter from Singapore. Now, there is ABC bank of the U.S.A., called the issuing bank, which is the bank connected with Mr. A and XYZ Bank of Singapore, called the advising bank which is the bank connected with Mr. X. The advising and the issuing banks charge a certain amount of fees and commission for the services they provide. So in a simple LC scenario there are 4 parties involved. In all, a letter of credit has 8 steps from the time the transaction originates to when both the sides are compensated. Mr. A places an order with Mr. X and is expected to submit a Letter of Credit to Mr. X. So, he goes to ABC bank and submits an application requesting a Letter of Credit in favour of Mr. X. Once the issuing bank, ABC Bank satisfies itself with the credentials of Mr. A, it issues an LC which it passes on to XYZ Bank, the advising bank. After XYZ bank checks the authenticity of the LC issued by ABC bank and makes all other relevant checks, approves it and informs Mr. X that an LC is issued in his favour. Then Mr. X prepares all the necessary documents related to the contract submits his bank for approval and simultaneously releases his goods for delivery to Mr. A. These submitted documents are verified by XYZ bank which after approving them sends it to the ABC Bank. After the issuing bank, ABC Bank checks and approves the documents sent by the advising bank, it releases the documents to Mr. A and also charges commission and fees from him, who can now take the delivery of his order against these documents. ABC bank now releases the payment to XYZ bank who then credits to the Mr. X’s account after charging some commission for the services provided. What is hard currency and soft currency?